Lur Hostel is what any of us want when we travel to another city! 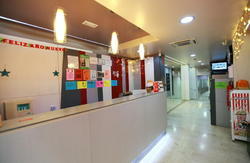 Comfort, tranquility, good location, friendly and personalized staff. - Spacious, bright and comfortable rooms. - Provide your own key to the building and electronic card for each of our rooms. - Towels provided in single and double rooms. - Heating / Air conditioning in communal areas. - Free Wifi throughout the hostel. - Free access to the fully equipped kitchen. Located in a privileged area of the enlargement of Barcelona, offers proximity to the main attractions of our city and easy access by public and private transport. We are a family with a great love for travel and the many trips we have learned everything that a traveler wants to find when visiting a distant and unfamiliar city, everything that makes a pleasant trip into and unforgettable. • Two bedrooms with bunk beds 4 and 6 respectively, ideal for groups or families. Check-in time : 13:00 - 22:00. Call the hostel in case you need to arrive after 10 pm. Self-service continental breakfast is not included. 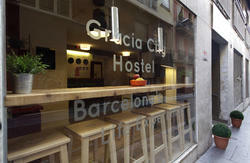 Taxes not included (0,75 EUR per person/day the first 7 nights). - Train: to Sants station - change to Metro L3 (green line) and get off at Passeig de Gràcia. - Bus 'Aerobus' to Plaza Catalunya. 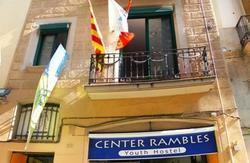 From there you can reach Lur Hostel in 10 minutes walking or taking the Metro L3 (green line) and get off at Passeig de Gràcia. - Taxi: 25 min. / Cost approx. 24 to 29 EUR. Special Bus to Estacio del Nord (Barcelona). From there you can take the Metro L1 (red line) to Plaça Catalunya station and then take the Metro L3 (green line) until Passeig de Gràcia station.